I'm beginning to reach the end of this project. Just putting the finishing touches to the SBD-2 Dauntless flown by Lt. Iverson. This will be the eleventh kit. 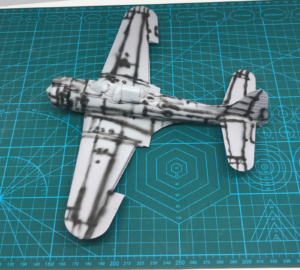 Still have two to go so the tally will end at thirteen if not a conversion kit for making a B-17G Flying Fortress into a B-17E miraculously should turn up. But the chance of that happening looks bleak. While doing the Marauder I decided to include the SBD-2 into the project. Reading about Lt. Daniel Iverson and navigator Wallace J. Reid and in what state they returned to Midway made my mind up. Also the fact that the plane was patched up, used as a trainer and then lost in Lake Michigan to be salvaged in 1993 and now in a museum helped. The kit is originally from Accurate Miniatures but my version was sold by Academy. Lucky for me the decals was for Iverson's plane. The kit is generally a good one and really needs no changes. So basically I built it out of the box. The only extras I used was paint mask for the cockpit hood and the national insignias. The national insignias would have been hard as decals because the wings have some kind of intakes just where the insignias goes. The only snag is that Hasegawa's kit of the SBD-3 does not look as promising. I hope that it does not become a disappointing finish to my project. I finally bought the Vindicator. I found one reasonably priced kit on Ebay. It lacks the decals but that doesn't matter too much as I've also bought paint masks for the plane I want to build. I'm looking forward to receiving it because it's also an Accurate Miniatures kit. Also the item on Ebay was titled "2 X 1/48 Accurate Miniatures SB2U-3 Vindicator" so it will be interesting to see if it's just one kit or if it's actually two. According to the package tracking it's just arrived at customs clearance in Sweden. After the Vindicator it's only the hero of the battle left, the SBD-3 Dauntless. If I manage to do these two during May the project will have taken me a year. Still that's included a stop of several months when I was moving. 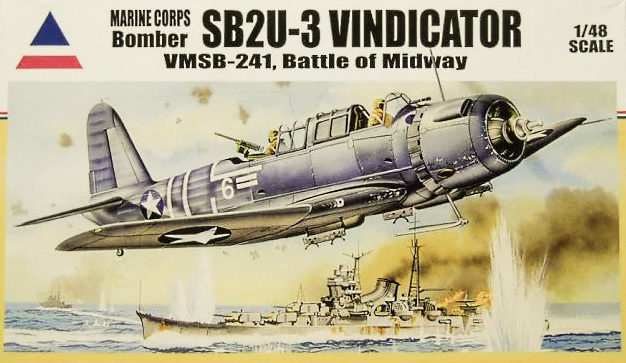 I've started a project web page where I will write the Battle Of Midway story with pictures of all my kits.